The new study challenge for the next two weeks is to follow along with Ahmed Aldoori's 100 head challenge. His challenge is to do 100 heads in 10 days, but for our version I just want you to do as many heads as you have time for, for the duration of this 2 week challenge. 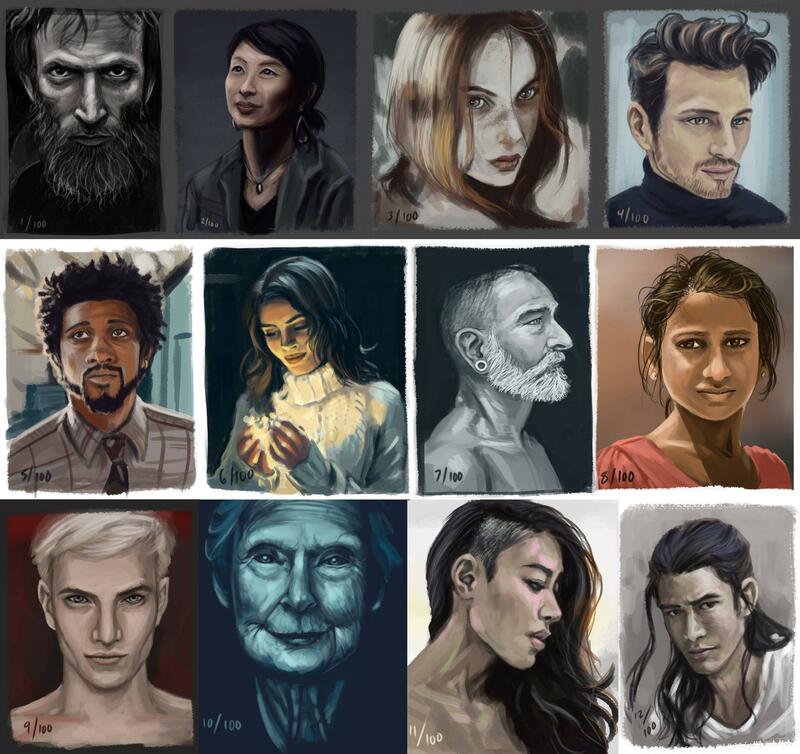 The focus is to get a lot of drawing in, so keep it loose, experiment, and use the large number of drawings to try different styles and approaches. These challenges are great for building your visual library and knowledge of the structure of the head and the variety you see within it, but I think it's equally important to apply what you've learned. So I would suggest drawing/painting a head from your imagination here and there to really apply what you've been learning. -Approach it with an idea of what you'd like to focus on and learn from the study. -Due before Sam's on stream review on Monday, February 4th. Last edited by Nowis-337 on Sun Feb 03, 2019 8:57 pm, edited 1 time in total. Managed to get 25 done. Went from sketches to greyscale. I'm gonna make it 50 over the next week or so and gonna switch to colour soon. Last edited by Seano9 on Sun Feb 03, 2019 6:27 pm, edited 1 time in total. For this I focused on color and values, doing each image 30-45 minutes and taking my time for study as well as color choice.